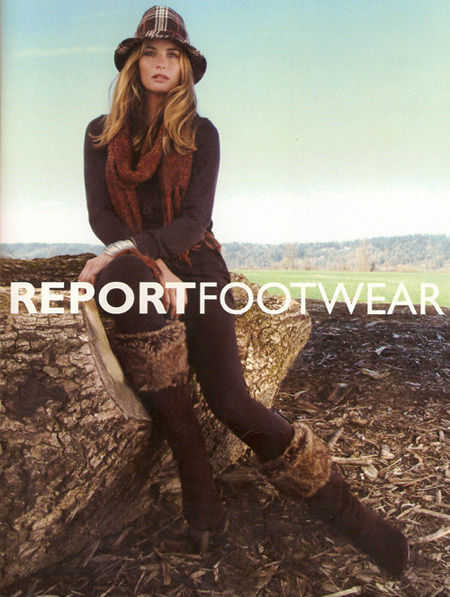 The fall ’09 REPORT Footwear ad campaign was inspired by nature’s green fields and wood-filled landscapes. In addition to nature, the ’90s music scene provided inspiration with its grunge clothing, including worn denim, layers, plaid scarves and belts, that give a roughed-up, casual and laid-back vibe. The photoshoot took place in the countryside in Duvall, Washington featuring Ricki Lander from Ford Models. Images tell a story of a young woman visiting the country from her urban lifestyle. She brings with her sunglasses and a beret, making the photos up-to-date and feminine, with a touch of French countryside. The setting is cozy, warm, soft and very inviting. Photography and Art Direction provided by REPORT’s own Assaf Ziv. Hair and makeup done by Erin Skipley. I love the boots and the pics…to boot! haha. Erin! it was great to meet you at the Nest photoshoot. I didn’t realize then, but you did the hair and makeup for my friend Hollin Brodeur :) her photos turned out amazing and she looks great!